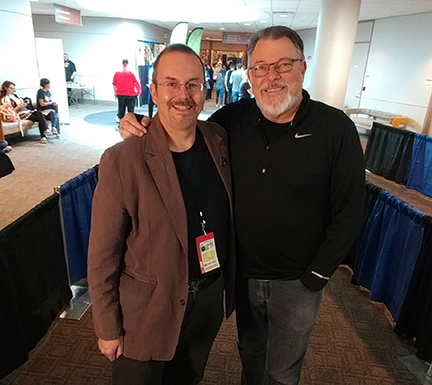 A little over a week ago, at El Paso Comic Con, I had the opportunity to meet Jonathan Frakes, who not only starred in Star Trek: The Next Generation as Commander William Riker, but directed two of the films and several episodes of the series. I told him a little about the Star Trek: The Next Generation script my friend William Grother and I had submitted back in 1991, which had made it to the producer’s desk, but wasn’t actually produced. We shared some kind words. His commanding voice and intense blue-eyed gaze, which made him perfect for Riker, stuck with me into the coming week. After El Paso Comic Con was over, I needed to write a new story for my book-in-progress, Firebrandt’s Legacy. The book is a combination of previously published stories and new material about Captain Ellison Firebrandt and his crew of space pirates aboard the good ship Legacy. My goal has been to create a set of stories that work together as a satisfying story arc. The new stories are there to bring the story arc together and then bring the overall story to a satisfying conclusion. I’m about two-thirds of the way through the process and hope to finish the book over the summer. The story I needed to write required a character who could put the indefatigable Captain Firebrandt into a tough spot. Firebrandt’s a privateer and he’s mentioned several times that he answers to authorities on Earth. I decided the time had come to show readers who exactly Captain Firebrandt answered to. I saw this person as a tough admiral who manipulates people and ships like pieces on a chessboard, doing everything possible to keep Earth out of open conflict because, frankly, in this universe Earth would be seriously outmatched in an open conflict. Because I wanted this to be a memorable character, I wanted to think of aspects that would bring him to life for the reader. One of the tricks I sometimes use to do this is to imagine the actor I would put in that part if this was dramatized. Jonathan Frakes with his intense presence seemed just the kind of person I would cast as the person to put Captain Firebrandt in a tough place! A writer can also reverse this trick and think of a character who has characteristics very different from a familiar actor or character and then visualize that person. Another time I needed an opponent for Captain Firebrandt and his crew, I wanted to create someone who was capable, but not exactly likable. I turned to Sir Patrick Stewart and his portrayal of Jean-Luc Picard. However, I didn’t want a Picard, I wanted an anti-Picard. The result was William Robert Stewart, a posturing, arrogant, loud-mouthed captain who is happy to let his feelings be known. Captain “Billy Bob” Stewart has appeared in two of my Firebrandt’s Legacy stories. I hope to release the book Firebrandt’s Legacy later this year, but why wait? You can read the stories as I edit and write them by becoming a patron at my Patreon site. Just click the button below or at the right side of the screen. For just one dollar a month, you’ll get a brand new story, plus behind the scenes information about the stories. I’ve also given away a free ebook of The Solar Sea to patrons and I plan to give away the complete ebook of Firebrandt’s Legacy to my patrons as well. For that matter, if I get a few more patrons, I might be persuaded to send out signed print copies. What’s more, patrons get a chance to be mentioned in the book’s acknowledgements. You want more? I’m also working with a very talented group of voice actors to create a full-cast audio dramatization of the book. So, why wait? Sign aboard the Legacy today! This entry was posted in Books, eBooks, Events, Publishing, Writing, Writing Tips and tagged Captain Firebrandt, character creation, characters, Firebrandt's Legacy, Jonathan Frakes, Legacy, patreon, Patrick Stewart, serial novel, space pirates, stories.